NEW TRI ALLIANCE CYCLING GEAR + SOCKS! From the large amount of activity on social media over the weekend it was evident that almost everyone in the squad was out training, racing or travelling to train or race. And to make it even better the weather gods smiled on us all with plenty of warming spring sunshine from Melbourne to Queenscliff, The Great Ocean Road and up to the Sunshine Coast. Read all about the weekends training and racing here. The key after such a big weekend is to recover adequately with appropriate sessions alongside massage, rolling and good body maintenance – which includes plenty of sleep. Get this right and you’ll be flying once we get stuck into the speed sessions which are now filtering into the programs. If you are unsure about your recovery or still feeling flat/heavy legged please chat with a coach before your session to ensure it is appropriate for you . We had a number of athletes swimming last night who had raced hard at the weekend and this was prime for plenty of easy drills and kicking to flush the body through. That said we do have our wind trainer (please bring your own if you have one tonight) FTP and heart rate test tonight at MSAC and run timetrials on Thursday so be ready for a couple of short spikes to see where you are at and the progress since the last round of testing 6 weeks ago. Swim time trials will be next Wednesday. A well attended team meeting at Elwood last Thursday saw the new cycling kits get handed out alongside updates from within and outside of the club regards all things Triathlon. 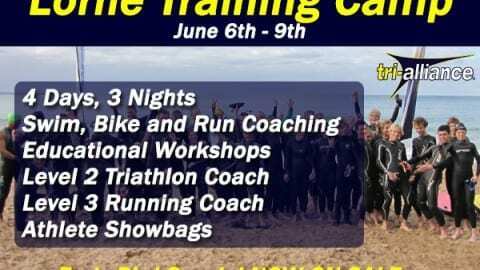 Race season, races and the summer program where detailed alongside body maintenance and the revisiting of goal setting. A good night and great to see many new faces. Do not forget to order your SHOTZ products this month as you increase your training volume. We supply one of the cheapest prices on-line to ensure our members are not being disadvantaged. NOOSA FACEBOOK GROUP We have another mass exodus from Melbourne to Noosa this year with around 50 plus athletes. If you’re coming to Noosa this year join the group and get the low down on everything that’s being planned. Remember there are several hold the dates for in Noosa, Race day TA Taj, drinks and festivities, Tri Alliance Race Day After Party, Mad Monday @ Noosa Life Saving Club and Melbourne Cup in the Sun at a venue TBC! 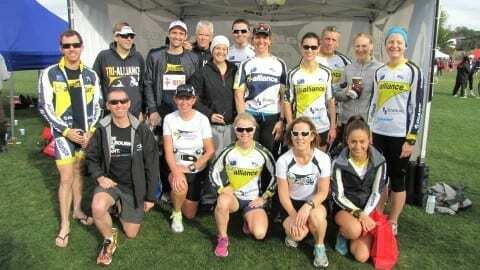 As 25 athletes and coaches tackled the pre-season training camp in Queenscliff (read about it here) a few of our athletes travelling inter-state to race the IRONMAN 70.3 up on the Sunshine Coast. Stephen Drake completed his first half Ironman in a creditable sub six hours showing the hard work he has put in recently has been paying off. Cresseda Beale has been battling her demons in training recently but her goal was to finish and she did that – it was those Dandenong Skyhigh climbs that made the race seem easy we think! Simon Gronow was also racing taking on another half in a shade over 6 hours – well done all, recover take stock and focus on the next goal. Down on the Ocean road Amy’s Gran Fondo was being held with a number of Tri-Alliance riding and racing different distances. A big shout to Jonney Yeates and Kat Henderson who smashed out and qualified for the UCI amature 2016 road cycling champs in WA with impressive displays on the 110k course. For those who are still planning their racing season there are plenty of opertunities with entries now open for the Gatorade Triathlon Series 15/16. 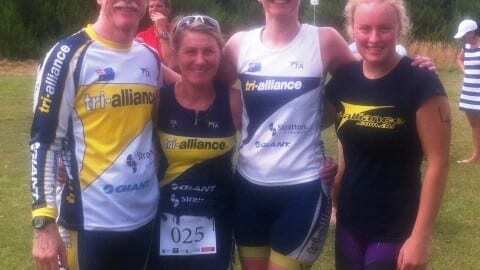 The 5 race series comprises of Sprints, Olympic Distance and mini races. 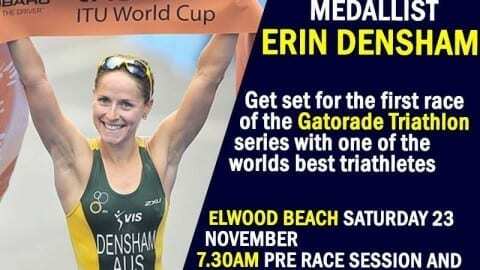 Elwood and St Kilda host the Bayside races with Portarlington hosting it’s 30th anniversary race. Don’t forget Tri-Alliance members receive a 10% discount when they enter and select us as their club. Our pre-season camp down on the Bellarine Peninsula based at Camp Wyuna in Queenscliff had 25 athletes and coaches being put through their paces. This designed training spike including some race efforts will see them much stronger in a couple of weeks once recovered and adapted. Well done crew – it was indeed a testing and challenging camp for all with some achieving personal bests across ride and run for the weekend. A couple of attendees gave us their testimonials – so if you missed out – see what they thought and maybe get on for the next camp! “Wow, what can I say, preseason camp was for me an incredible success. “Heading off to the Pre-season Camp I was questioning what I had signed up for. But the weather forecast looked delightful and the itinerary looked daunting but I figured it was just one weekend and I just had to attack it head on. After speaking to the coaches I was hitting this camp to peak in my running in preparation for the full marathon in October. And to think I was concerned I wouldn’t get my 32km long run in…. I couldn’t have been more wrong. We arrived on Friday for a lunch time familiarisation ride to Portarlington and back before a quick 2km run off the bike before prepping for an 11km run in the afternoon along the Bellarine Rail Trail. By now we were well and truly ready for a good feed at the Queenscliff Bowling and Croquet Club. After a good carb loading dinner we headed back to camp for a briefing for Saturday, I am hoping I wasn’t the only one who harboured a few nerves. Saturday began with a 5am rise and roll out at 6.15am for 4-5 hour ride around the roads between Queenscliff, Torquay and Portarlington, we were treated with spattering of rain and some slight hill efforts, but nothing a 20 minute run off the bike wouldn’t fix. After a good ocean soaking we enjoyed some stretching and RnR followed by a solid lunch. We saw the afternoon out with a ride or a drive to Portarlington for an open water swim at the Portarlington Pier finishing up with a long run along the coast. After a refuel and a decent coffee at the Portarlington bakery we were so ready for a parma, stretching session from Greg and an early night! As our alarms sounded on Sunday morning I seriously questioned how my glutes were going to pull me through the super Sunday session, fuelled with my hearty pre-soaked oat creation we rolled out at 6.30am for 2 x ride and run TT efforts. Smashing ourselves out to Portarlington and back, we made friends with headwinds and hills with a 5km hard effort off the bike. Nutrition was consumed and foam rollers were abused before we headed out for the second identical TT set. Fortunately for us, the coaches were never too far away to offer a helping push to ensure that we were continuing to exceed expectations and smash our own results. Finishing that last 5km was definitely a satisfying feeling and we all but ran into the freezing cold waters of Queenscliff for a final soaking. We started to clean our rooms and pack up our gear before signing out with a cool down recovery run/walk before we trekked back to our homes for some much needed sleep. Our new cycling gear is now available – 11% cheaper than our previous Elite kit. Be ready for the new season in some stylish new kit. For those who attended the Lorne camp we have contacted you with a coupon code for your order – sizes are the same as the existing Elite gear so get onto the shop and place your order. Also in the new style we are taking pre-orders for cycling socks! We do still have some of the previous cycling gear in various sizes still available which is on special to make way for our new stock. Check out the TriShop here to see what we have. As discussed at the team meeting our next home based training spike is Hell Week (just before Christmas) and the next Camp is Falls Creek at the beginning of January. For the Falls Creek camp (1st-8th January 2016) we have a very limited number of spots so please email Scott to get your name down on the list. We will then be contacting these athletes within the next few weeks regards a deposit to lock in their place. Satruday 19th – Recovery Ride – Elwood Roll at 7am. Distances based on programs and abilities. From 40k to 140k. Facebook group here.